Did a 5k this afternoon, and although it's my first proper attempt I'm going to claim it as a PB. 27:37.8 @ 2:45.7, 37spm. That's 2s per 500 faster than my 2k best, so very pleased with it. I do like this kind of distance / time and really enjoy the point somehere about halfway through where the rate and pace becomes metronomic. Did this one without using a step and better controlled my action to avoid hitting the cord travel limit. This was the first SkiErg I've done at a higher damper setting (5); previous attempts were on 1; surprised how ok it felt. Nice 5k, Paul. I'm impressed with your times. So far I've only been using damper 1. Thanks John. I was quite surprised by the damper setting 5 - I half-expected it to present to much force for me to sustain, but it was really quite ok. In fact I found myself tuning into catching the fan at the start of the stroke really quite well so that I could get good efficient acceleration early on whilst I was still in a strong posture, with minimum fan slippage. 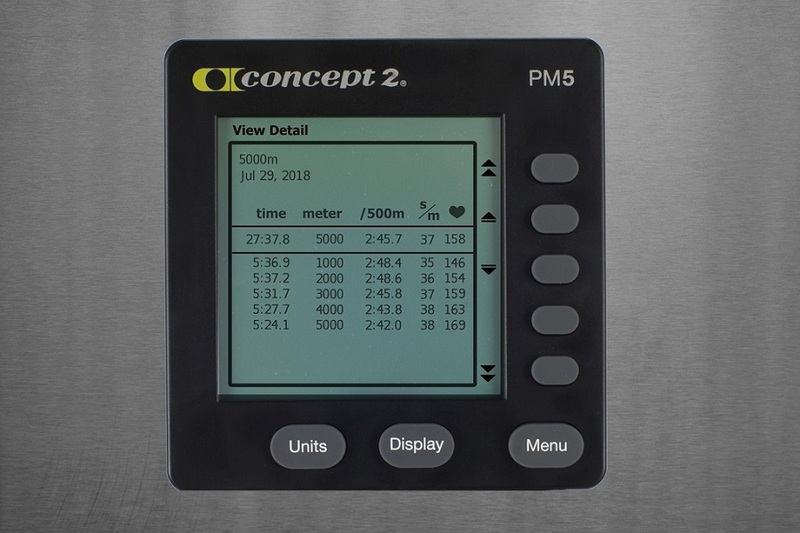 I did my first 30' test today and smashed my 5k pace from a few days ago, at 58df and 39spm. This was getting quite difficult the last 6 minutes when pushing the pace. I'm not quite ready for a longer distance yet but would like to try a 10k in a week or two. Good one John - looks like you will be able to make a significant improvement on your 5k time and move up the ranking. Thanks Paul - looks like you're ready too. That 30' test wore me out. Today I did 9k easy, then surprisingly smashed my PBs for 500m, 1', and 100 meters at 45, 51, 56spm and 64df. My first attempt at a 2k pb this morning went well, with positive splits and faster than expected. Then I mistakenly attempted a 500pb and blew up, trimmed time by a tenth, but ended up totally worn out afterwards. It will take me at least a few days to recover, maybe a week, and I hope to never again try that double. Set a 1' PB last night. Came at the end of 2K rower, 2K skierg, 2K rower, 2K skierg, 2K rower, 8x1' with 1' rest. Still slow. I'm tied in my age group with a woman the same age. You should enter the ctc for this month. New 10k pb this morning, first in my age group to do one this year. I was apprehensive to start, but all went much better and easier than expected. The last 2k was 8s faster than my 2k a week ago. Now I'm going to rest, relax and recover. That's a really good pace for your 10k John. You will have to try the 5k and 30min again - you should be able to get 6k for the latter if you can do the same pace. New PB for the 2k tonight: 10:26.0 - beat my old time by 45s. Admittedly, this was only the second one I've done, and I knew my first one was a bit soft, so I didn't have to kill myself to comfortably beat it. Still, as hjs says, a PB is a PB. Thanks, Paul. I will like to do the 30min again soon.